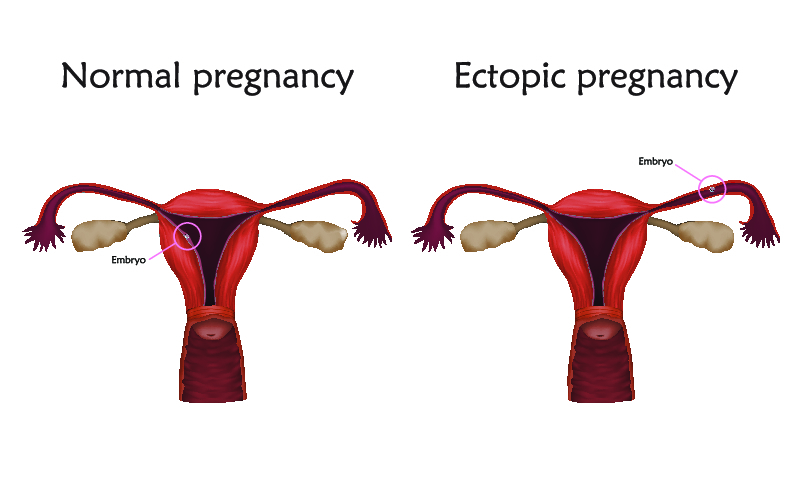 What Is An Ectopic Pregnancy And Why Does It Happen? In a normal pregnancy, a fertilized egg implants in the wall of the uterus, where a fetus has room to grow. An ectopic (or “tubal”) pregnancy occurs when a fertilized egg implants somewhere outside of the uterus. In most, but not all, cases this happens in one of the two fallopian tubes. An ectopic pregnancy can be dangerous and even life-threatening. This is because as the pregnancy grows, it doesn’t have enough room. It can cause the tube to rupture, which leads to internal bleeding and possibly shock. Why an ectopic pregnancy happens? What are the signs and symptoms of an ectopic pregnancy? In the beginning, an ectopic pregnancy feels like any normal pregnancy, with tender breasts, a missed period, and feeling tired. But eventually other signs and symptoms occur, such as vaginal bleeding and pain. A woman with an ectopic pregnancy will probably experience cramping on one side of the lower abdomen and pelvis, but low back pain and general pelvic pain can also occur. It is also possible that a woman may not experience any symptoms until it ruptures. In the event of a ruptured ectopic pregnancy, the lower abdominal and pelvic pain becomes more severe. This can happen suddenly. There may also be shoulder pain, dizziness, weakness, and fainting. On examination by a clinician, the woman’s abdomen will be tender to touch, and a gynelogical exam will be very painful. Additionally, her vital signs (blood pressure, heart rate, and breathing rate) may be abnormal. Any of these signs and symptoms needs to be addressed immediately. How do I know if I have an ectopic pregnancy? Because early ectopic pregnancies aren’t always seen with ultrasound, a test for the level of a hormone called human chorionic gonadotropin (hCG) may also be helpful. This hormone is secreted by the developing embryo and placenta. By watching how much the hCG level changes over a couple of days, doctors can use this to help determine if there’s an ectopic pregnancy. In other words, if they can’t see a pregnancy in the uterus and the hCG level doesn’t behave like it should, this could indicate that there’s an ectopic pregnancy. Taran F et al. The Diagnosis and Treatment of Ectopic Pregnancy. American College of Obstetricians and Gynecologists. Ectopic Pregnancy. Ectopic (Tubal) Pregnancy (Beyond the Basics). Dr. Mandy Armitage is a board-certified physician and writer. She is passionate about education, for patients and clinicians alike. In her free time, she enjoys spending time with her family, reading, traveling, and attending live music events.